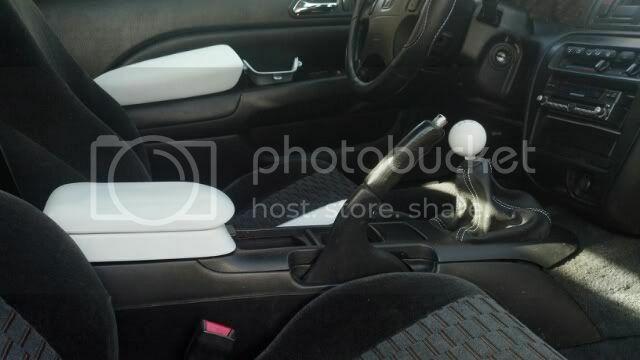 I would like to paint some of the plastic interior pieces of my 5th Gen. Specifically the Stereo bezel, and the plastic pieces on both doors. Duplicolor on vinyl, krylon on plastic. Wash with soap n water after carefully removed from the car with a door panel removal tool. Wipe with a soft brush like a toothbrush into textured plastic or vinyl. Rinse thoroughly. Let dry 24 hrs. coats. Let cure in 70+ temp about a week. (I waited 2). Paint in 70+, still weather, preferably indoors in good ventilation. I painted under a tree with some wind. Tree stuff and bugs were an issue during drying time. It was 45 when I painted so I painted in direct sunlight. No harm no foul but longer curing time and removal of small items from the tree droppings between coats resulted. The console is installed, door panel elbow rest was a test to decide install or not. These parts used to be tan. Last edited by bykfixer; 04-15-2013 at 06:38 PM. Something like bezels that are smooth... you might consider real fine sand paper like 800 grit. Paint will adhere better in high wear areas such as glove compartment opener or plastic elbow rests, that sort of thing.